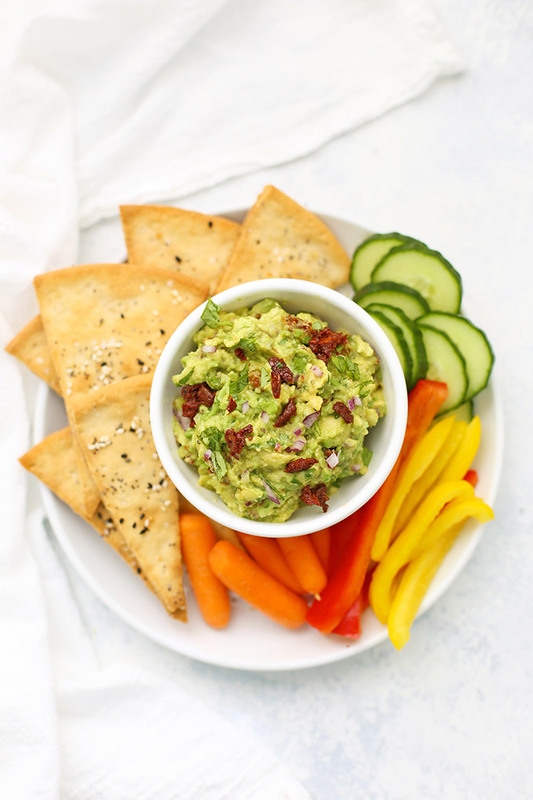 Sun Dried Tomato Avocado Dip + How to Make an Amazing Healthy Snack Board – This go-to entertaining tip will keep guests and hosts happy! 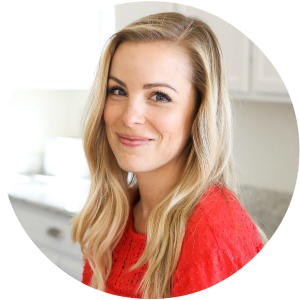 Read on for all my best tips on putting together a healthy snack board for your next get-together! This post is written in partnership with Sprouts. Watch me make this recipe (and two others!) live Thursday November 16th at 3pm MT on the Sprouts Facebook Page! 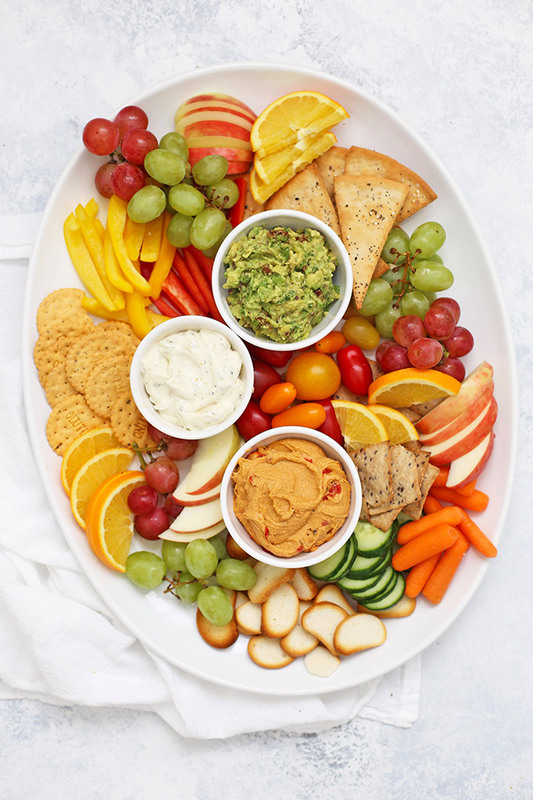 MAKE A HEALTHY SNACK BOARD! If your family is anything like mine, the amazing scents wafting out of the kitchen tend to beckon everyone in! Especially when you have a big meal ahead of you like a Thanksgiving feast, everyone seems to be peckish and snack-y while they wait. 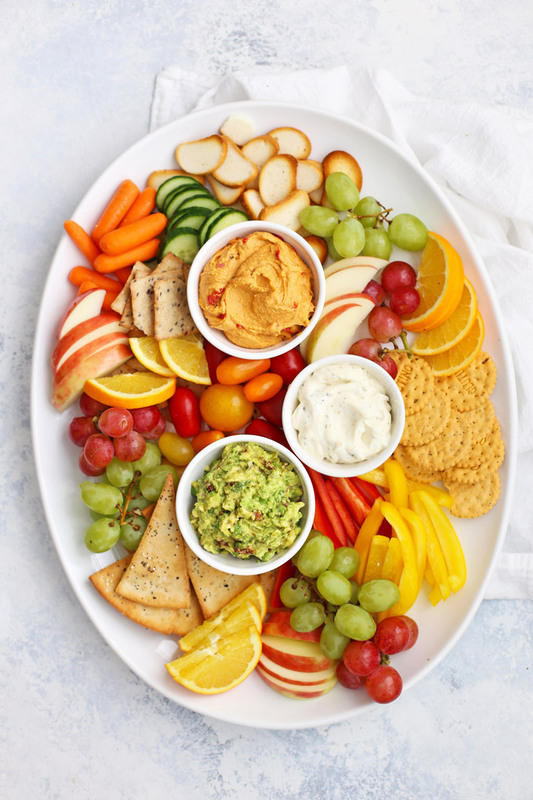 Rather than having everyone eat now what I plan to serve later or sending them out hungry, having a healthy snack board is a great way to help curb hunger. I have something to offer, so I don’t have to turn hungry guests or little ones away empty-handed. No one will sit down to Thanksgiving having already polished off half of the stuffing or having absconded with a turkey leg. If they DO fill up before the meal, it’s on things like apples and carrots with dip, not all the pies we’re saving for later! I tend to put out 2-3 options for dips. Having a few options means there’s something for everyone and a few different flavors to enjoy. Plus, it just looks so darn pretty on the plate or platter! 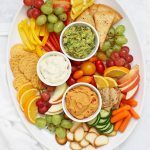 I like doing hummus (homemade or one of the yummy options at Sprouts) that goes well with both veggies and crackers, a ranch or veggie dip that’s always a hit with kids, and a third option. Sometimes that might be a sweet fruit dip. Other times, it’s something more special, like pineapple guacamole or this Sun-Dried Tomato Avocado Dip. It’s a fun twist on my classic guacamole, made with creamy avocado, a mix of lemon and lime juice for brightness, sun-dried tomatoes for depth, color, and a little tang, and some fresh cilantro to tie everything together. It’s AWESOME. I serve it with a few kinds of veggies and crackers. It’s amazing with homemade flatbread crackers (see below), but I also love it with things like Glutino crackers or their giant gluten free pretzels. The next layer is a mix of colorful fruits and veggies. The bright colors draw us right in, and look like art on a plate! Some of my favorites are things like sweet bell peppers, baby carrots, snap peas, heirloom baby tomatoes, and cucumbers. I also toss in a few sweet options–red and green grapes, sliced apples, and oranges or clementines. Fresh veggies and fruits lend lots of lovely crunch, but I always find myself wanting a little something salty or savory to go along with it. That’s where the crunchy stuff comes in. Pretzels, crackers, crisps, flatbreads, or things like rosemary or Marcona almonds or candied pecans are ALWAYS a huge hit. Glutino is one of our go-to brands for gluten free crackers. They have a pretty extensive line of options to choose from. Our favorites are the round crackers (original and vegetable are our favorites) and their pretzels and pretzel sticks. They offer several flavors and varieties and we haven’t tried one we didn’t like! 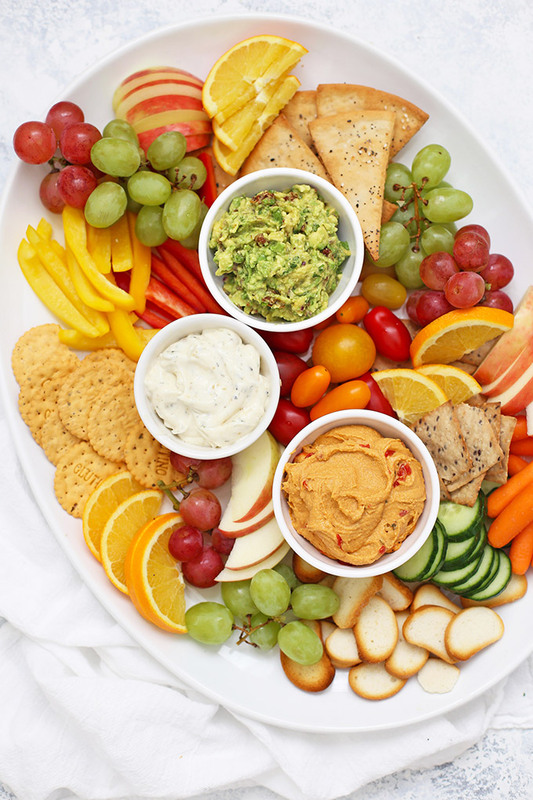 Sprouts carries a nice variety and usually has the best prices, so we keep them on hand for snacks, get-togethers, and snack boards like this. As far as putting everything together the beauty of this is that the colors of fruits and veggies make this look bright and beautiful no matter how your arrange them! Mix and match in sections, like I did in this board, or arrange them in groups (all the veggies together, all the fruit together, all the crackers and pretzels together, etc.). You can’t go wrong! Brush pizza crust with olive oil and sprinkle generously with salt and seasonings. Slice into triangles and place on a baking sheet. Bake at 350 degrees for 10-12 minutes, or until golden. Remove from oven and let cool before serving. 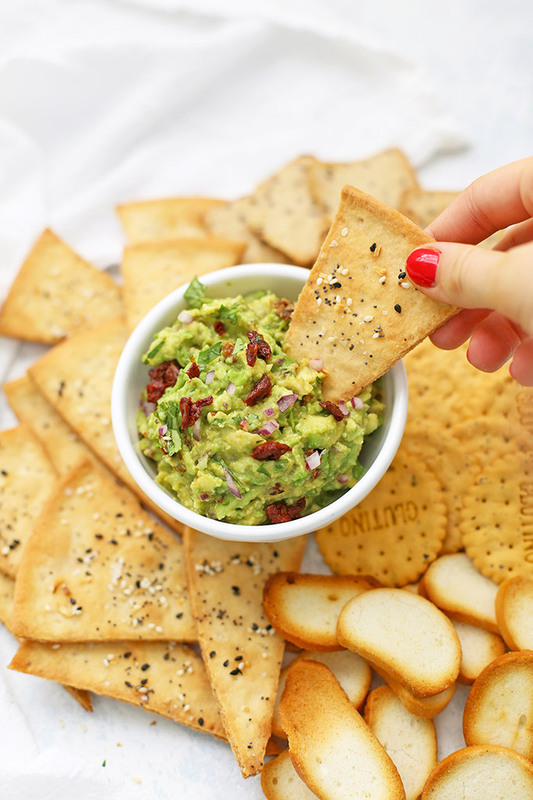 While the crackers are baking, make your avocado dip. Mash avocados with sun-dried tomatoes, cilantro, red onion, lemon and lime juice, salt, and pepper. Garnish with additional cilantro or red onion as desired. Serve with veggies, flatbread crackers, and your favorite dippers! « Classic Gluten Free Stuffing (or Dressing!) – With Video!